The Martin 15 Series Guitars fall somewhere in the middle of Martin’s range of guitars. Of course, given Martin’s focus on high end guitars, the 15 series guitars are of very high quality and will still set you back a reasonable chunk of cash to buy one. There are 9 different guitars in the 15 series and they all share a couple of things in common but all with differences too. Below we’ll take a look at each guitar individually in detail. Don’t worry if the names look confusing now, you’ll understand what each bit means after we look at them in more detail. All prices are in US Dollars and are the MSRP (Manufacturers Suggested Retail Price). Starting with the dreadnoughts and the most basic, and least costly, model, is the D-15M. If you love the sound of Mahogany, then chances are you’ll love Martin’s 15 series guitars. With all solid wood Mahogany top, back and sides they’re certainly not lacking in that mahogany sound! So if you like your guitar to be rich and warm and with a mid-range focus accompanied by subtle treble and distinctive but warm bass, then this is worth looking at for sure. The D-15M is for anyone who wants the dreadnought shape and doesn’t need electronics or a cutaway. This model is virtually the same as the D-15M except that it has a “pre-war shading” finish on the top. Personally I prefer the look of this over the D-15M but I’m not sure that I would pay the extra just for that look – but that’s down to personal preference and how much importance you put into the looks of your guitar. The D-15ME is the electric-acoustic version of the D-15M and also has a cutaway (as a lot of electric-acoustics do). But the main difference is the electronics and the cutaway. The D-15ME features the Fishman Matrix VT Enhance NT2 electronics. Moving on from the Dreadnought models, we have the Grand Performance version of the D-15ME. The main difference here is that it is in Martin’s Grand Performance shape. This shape is a nice balance between the narrower waist of the 000 models but in a size closer to the dreadnought size. The shape will produce a less bass-heavy more balanced rounded sound and will be quite mid-heavy – especially given that it’s already all mahogany. The 000-15M is virtually the same as the D-15M, except that it is in Martin’s 000 shape. The shape is larger than the 00 but smaller than the Dreadnought and GP shapes. It has the same bridge style, bone saddle, standard taper neck and 1 11/16” (43mm) nut width as the D-15M (as opposed to the D-15ME and the GPC-15ME). The only difference between this and the 000-15M is the shaded finish on the top. Like the choice between the D-15M and the D-15M Burst, the choice here is down to which you prefer the looks of, and if you prefer the burst’s looks, if you are willing to pay extra. Again, I prefer the “burst” look – but it’s quite a bit extra to pay for it (IMHO). Now we have the OM shaped version. The OMC-15ME is virtually the same as the D-15ME except that it has the smaller OM (Orchestra Model) shape. The OM shape is the same as the 000 shape. This model just has the cutaway. As opposed to the GP model, this model has the non-scalloped X bracing like the D-15M. There are a few distinct differences between this model and the other 000 models. The neck joins the body at the 12th fret – as opposed to the 14th fret of the other models. Finally we have the 00 model. The major difference between this and the other models is that it has a 00 body shape/size. This is the smallest sized 15 series model. The 15 series guitars have a lot of things in common – all solid mahogany top, back and sides being the major similarity. And you have the option of having a cutaway or a non-cutaway and the option of electronics. There are also a couple of models with a shaded finished top if you prefer that look/are willing to pay the extra for it. As is usually the case with guitars, you should be able to find the 15 Series models for less than their published MSRP. 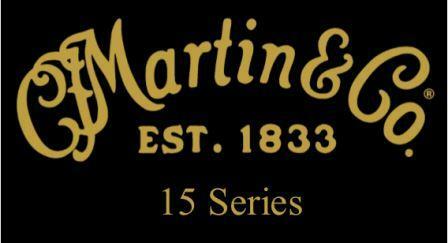 I hope this post has given you a good overview of Martin’s 15 Series guitars. Check out my review of the D-15M at the link below for a more detailed look at that particular model.